Change the look of your interior and provide top of the line protection ranging from general wear and tear to stains, rips, and gashes. 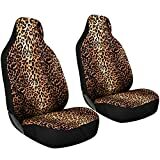 Made from high quality polyester, soft mesh exterior and a 3mm foam core; this 2 piece car seat covers set, is guaranteed to keep your new car fresh or renew the life of your old rust bucket. Comfortable and stylish, these easy to install/remove covers for integrated seats can conveniently be washed by hand, making this item an absolute no brainer. Available in a wide variety of styles and colors. DIMENSIONS: 20″L x 21″W x 31″H. EASY TO INSTALL: With a Combination of S-hooks and Adjustable Elastic Straps, these Covers for Integrated Seats are a Breeze to Install and Fit Most Cars, Trucks, Vans, and SUV’s. SET OF 2: Features Two (2) — 1 Piece Bucket Seat Covers – 100% Washable. BUILT TO LAST: Made from Durable & Comfortable Polyester, with a Breathable Mesh Fabric Exterior and 3 mm Foam Core. MULTIPLE COLORS: Car Seat Covers are Available in a Wide Variety of Styles and Colors. Able to resist general wear and tear, Oxgord cloth mesh seat covers aren’t just another fake replacement – it’s a seat cover to meant to give any car a better appeal, feel, and all for a great deal.